Producing the general fund budget book for the East Baton Rouge Parish School System is no simple task for its in-plant. 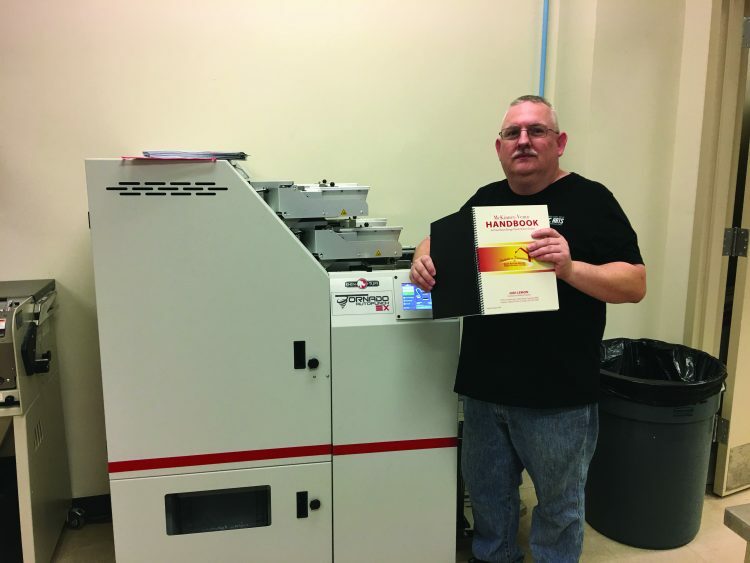 With 10 tabs and a UV-coated front sheet, that book used to be cumbersome for Production Manager Chad Simpson and his seven employees in the Graphic Arts Department. Since the shop’s HP Indigo 3550, HP Indigo 5r and two Xerox D95s could not run the tabbed sheets, each book’s contents had to be collated manually. Simpson would have to pull staff off of other jobs for a few hours to hand-collate text pages, index tabs and UV-coated sheets for punching and spiral binding. Occasional errors were the price they paid. Many other projects required the same hand-collating process — theater programs with UV-coated covers and black vinyl sheets, or tax plan booklets with multiple dividers and inserts. Pulling staff to hand-collate these jobs inevitably slowed down productivity in other parts of the operation. 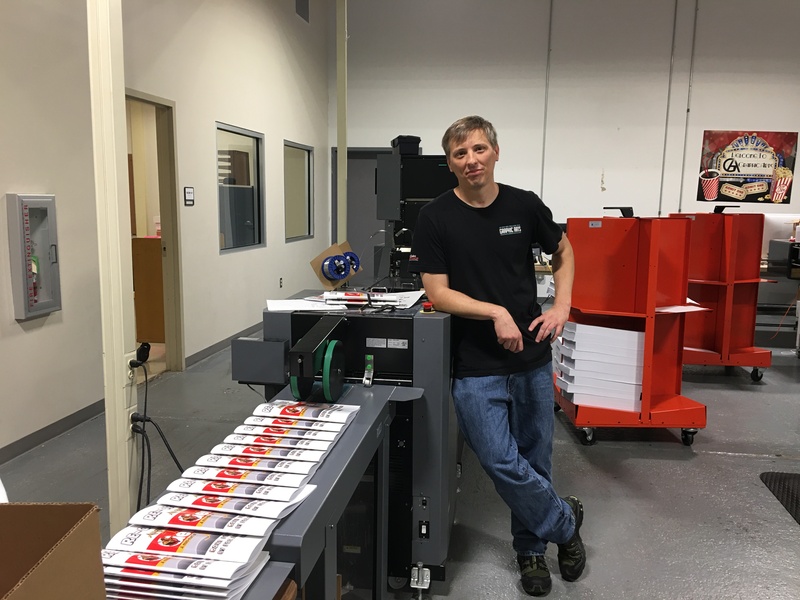 In April, Simpson finally put an end to all this by installing a Tornado Autopunch EX from Rhin-O-Tuff to automatically feed, collate, punch and deliver offset book stacks, ready for binding, using BDT Print Media’s advanced media handling technology. Chad Simpson stands with the new Duplo 646. 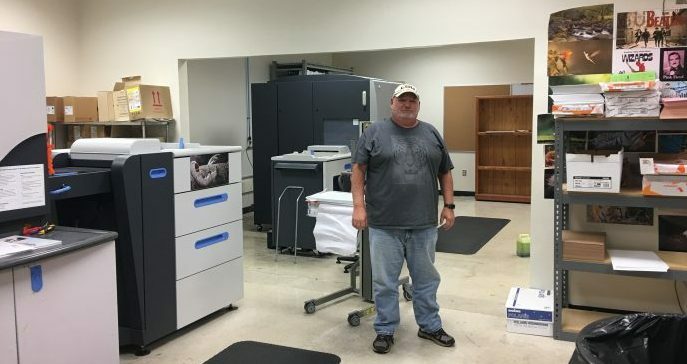 His operators can place the index tabs, inserts and coated covers in the interposer bins, and the Tornado Autopunch EX pulls them in the proper order to produce collated stacks, ready to be run through the Gateway Bookbinding Systems PBS 3000QS4 automatic coil inserter. This not only allows a single operator to handle the entire process, it ensures pages are always in the right order. Michael Brooks stands by the HP Indigo digital presses. The system handles media from 60gsm to 312gsm, including light porous/heavy coated print media and specialty binding media like plastics, vinyl and textures. The high-capacity main bin holds up to 2,500 sheets, including mixed media. The Autopunch EX punches up to 10,800 sheets per hour. All this has been a huge time saver for the in-plant. The in-plant also recently added a Duplo 646 slitter/cutter/creaser, which has enabled it to keep more jobs in-house, such as tickets or greeting cards. The Duplo 646 has improved the quality of the booklets the shop produces. “The creaser makes the cover look a lot more professional,” Simpson says. It has also made it easier to cut business cards, he adds. The in-plant has a booming wide-format printing business, utilizing a 64˝ CET Color Q5-250h hybrid UV flatbed printer, an HP Latex 365 printer and an Esko Kongsberg automated cutter. It has screen printing equipment as well — a 10-color M&R Sportsman screen press — which it uses to meet the high demand for garment printing. “T-shirts are big,” affirms Simpson.